Manage capital-intensive processes, specialized customer demands, and short lead times. The Marine Industry is one of the world's most competitive and capital-intensive industries necessitating a software tool to address market challenges by accelerating design, configuration and delivery to meet customer’s demands. 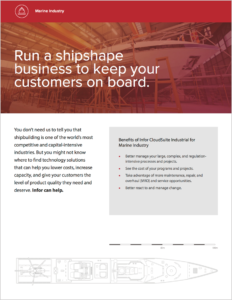 And once sold, the ability to maintain customer satisfaction levels through after-market programs that provide recurring revenue opportunities make the Infor CloudSuite™ Industrial solution a natural extension of a Marine Industries enterprise vision.